Yep. 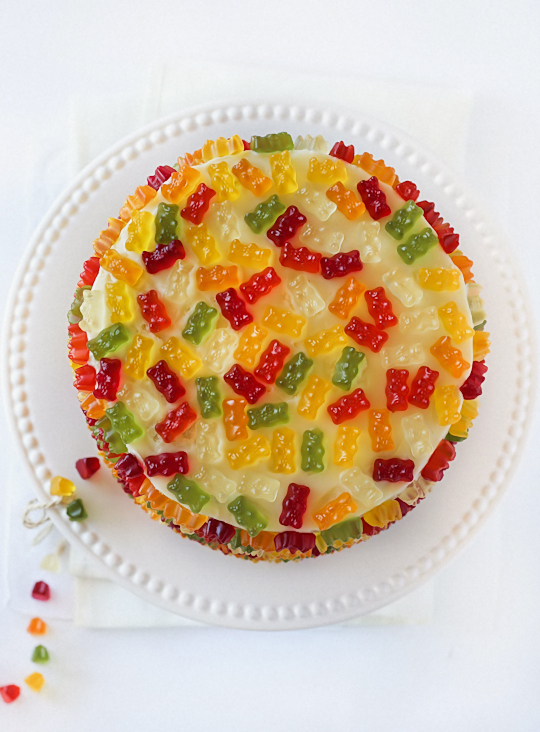 I covered an entire cake in gummy bears. It's been a while since I did a ridiculously over the top sugar high insanity cake (see Fudge Brownie Cookie Dough Cake), and what better occasion to do one than my friend Tomred's birthday? He is the supplier of all sorts of sweet treats in our office, with a constant supply of Tim Tams and gummy lollies, so this cake seemed appropriate for him. 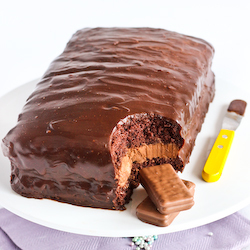 After all, I've already made him a Giant Tim Tam Cake. And I just wanted an excuse to cover a cake in gummy bears. 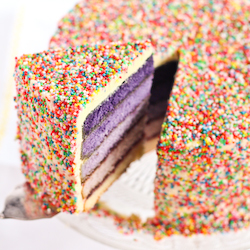 If I learnt anything from my Sprinkle Covered Purple Ombre Cake, cakes are always awesome when covered in sugar. My point is, try not to be too mad at me for making this entirely ridiculous and unnecessarily over the top cake. It's fun to go there every now and then. I mean, look at how pretty it is when you cut into it! 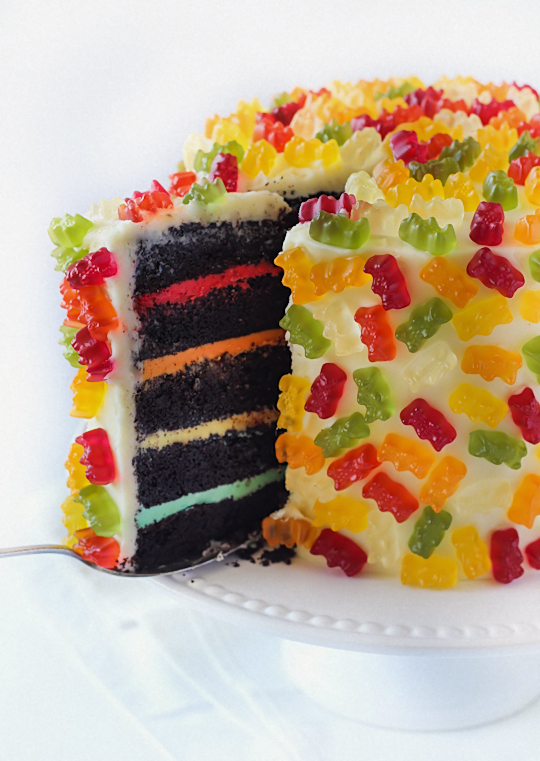 It's 5 layers of chocolate buttermilk cake layered with salted butter icing and each layer of icing is tinted to match the colours of the gummy bears on top. SO FUN. I did learn some hard lessons while making this cake. First of all, as great as this chocolate cake recipe is, the cake tends to crumble quite easily so it is not the most ideal for cutting into thin layers and covering in icing. It was a messy job. I'd definitely recommend chilling the cakes overnight before you cut them up, or you can use your favourite chocolate cake recipe as a substitute. I kept the icing simple, using a LOT if salted butter to try to counteract the amount of gummy bears (and I took sugar out of the cake batter too). You could use a Swiss meringue buttercream instead, but I tend to prefer regular butter icing to buttercreams. The gummy bears are a lot chewier than I remembered. So as awesome as it looks as a cake decoration, it makes it a little impractical when you are trying to have a bite of everything at once. And it does make it a little harder to cut slices, I felt bad cutting into the gummy bears! Of course you could skip the gummy bears or use less of them, but I just had to try this out to see how it looked. It was totally worth it. Just looking at this cake makes me happy. 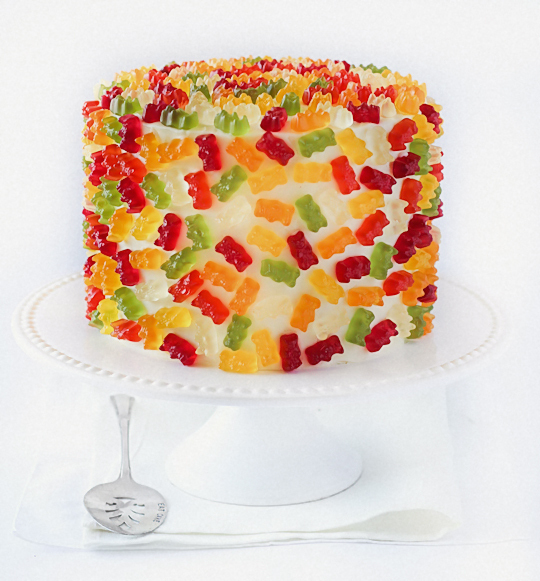 Even though I know that most people who eat the cake will end up picking off the gummy bears and saving them for later, I love the effect of the gummies. Plus it's like getting a slice of cake plus a lolly bag for later! So Happy Birthday for tomorrow Tomred! Thanks for being a friend who understands that your birthday cake will almost always come with a slice cut out of it for photographic purposes. It would have been cruel not to share an inside shot with you guys, right? Don't get too freaked out by the recipe, it makes a lot of cake so the amounts sound insane. You can halve everything to make a more normal sounding cake. To fill the cake layers and crumb coat the cake, place the 500g of butter in a large mixing bowl and beat until light and fluffy. Gradually add 500g sifted icing sugar while beating on low speed until combined, then add vanilla extract and beat on high until fluffy. Add milk 1 tbsp at a time while beating on high until you achieve desired icing consistency. Icing should be very fluffy and light in colour, easy to spread but stiff enough to hold its shape. Split mixture into 5 equal portions. Add food colouring to four of the portions, green, yellow, orange and red. Sandwich coloured icing between the 5 layers of cake. Use the remaining icing to crumb coat the outside of your cake. Chill in fridge for at least an hour, can be left overnight. Prepare more icing using the remaining ingredients and repeating the steps above, without adding food colouring. Using a spatula, spread icing smoothly over the top of the crumb coat. 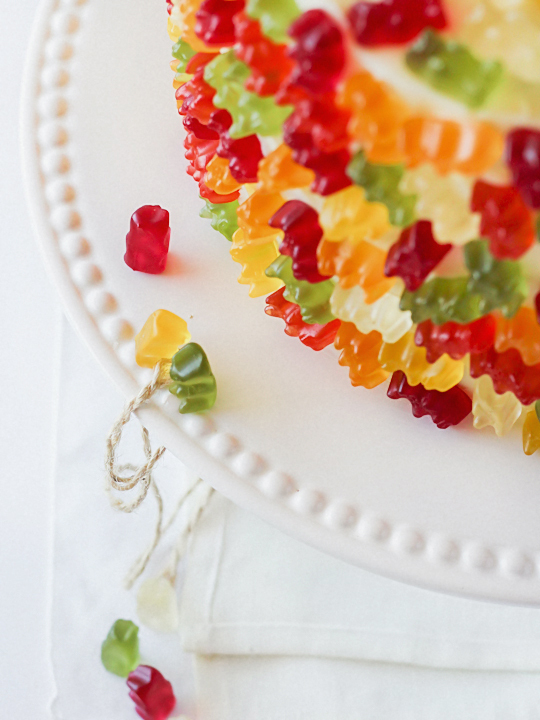 Decorate cake with gummy bears. Serve immediately or store in an airtight container until ready to serve. The last pic is the cutest Steph! Wow, this is so SUPER decadent! I love it! omgsh this is butter and gummy bear lovers( ie me) heaven! you are a genius! i love how u tinted the buttercream too! I'm glad you're not my close friend... I'd be so fat D: !!! But no, all joke aside, the cake looks awesome *_* I might try this one out for the kids at the community centre I volunteer for ^__^ You have great ideas! Omg how cute is the cake!!! This would put a big wide smile on every kids' face, including mine (the big kid)! I really love the different layers of coloured cream - too pretty! that is all kinds of amazing. 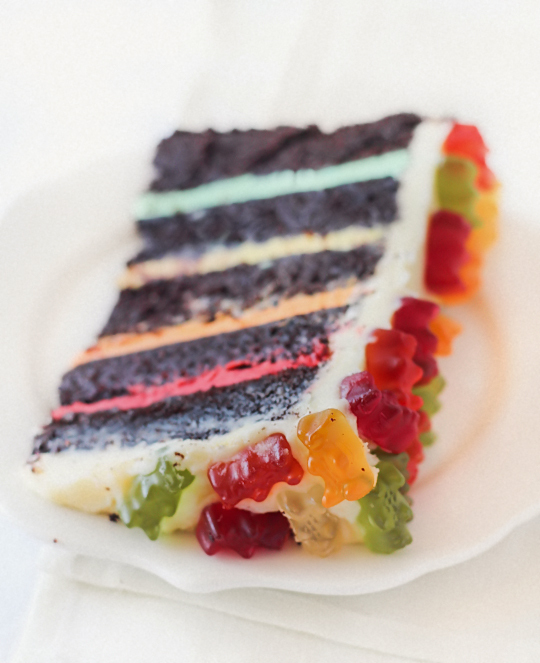 i just want to lick all the gummy bears off the cake! omg, just looking at this makes me giggle! this would have been so much fun to make! I love the rainbow layers. Wow, one of the most beautiful cakes I´ve seen. Full of joy and happiness, my sister would love it, full of those bears and fun to make. This looks amazing. Just wanted to say I made your purple ombre cake with the sprinkles on the outside for my fiancés birthday and he loved it! I made swiss meringue buttercream for the first time - it was a bit scary when it curdled but thankfully I saved it! Thanks for the inspiration. At first I thought that you scattered decapitated Gummi heads around the cake until I saw the last photo. Not as macabre as I first thought lol. This cake is all sorts of insane and I LOVE IT. Oh my word! I know a lot of little wrigglers who would die for this cake! It's AMAZING and then you cut into it and get all that yumminess!!! Just genius! THAT is one spectacular cake! This is so fun!! Love! Wow, this cake looks crazy! 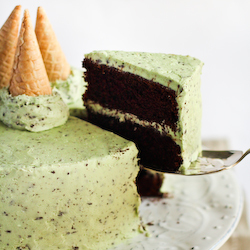 Definitely a guilty pleasure cake that looks insanely delicious! Wow oh wow. My husband is a gummy bear monster. This would make a perfect cake for him. I also love how you colore the frosting in between the layers. Love! This is so cool. Probably too much work for me to ever make, but it is VERY cool. Thanks for sharing. Ahhh so happy!! Love it! I would totally save the gummy bears for later though. Where did you get your cake stand? It is almost as fabulous as that cake! How do you get your icing so smooth?! It looks stunningly-yummy! You've done it again, Steph - brilliant! This is brilliant! I'll have to be careful that my husband doesn't see it or he'll demand one immediately. Kudos! That's freaking amazing!!! It's the worst thing for me to see right now, since I'm craving cake so badly! haha. It looks great!! Your cakes are always so fun, colorful, and playful! Awesome idea! 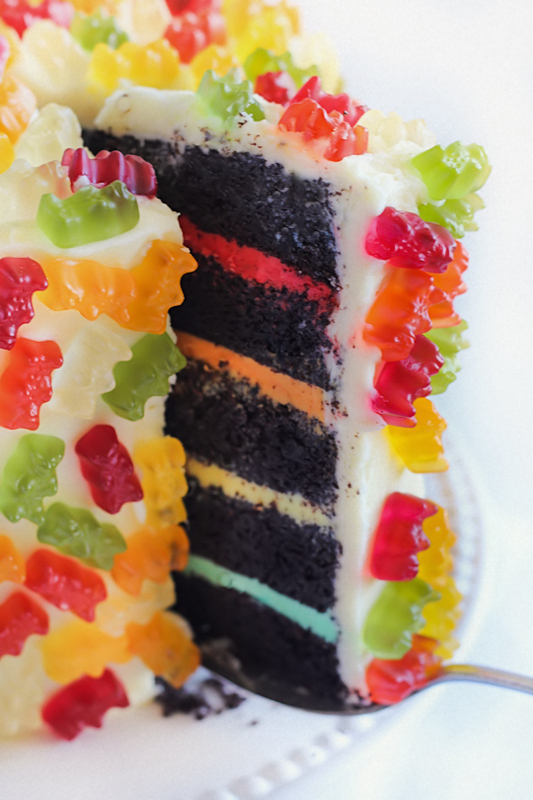 I love gummy bears and the idea of having them stuck all over a cake is awesome! This is absolutely brilliant! 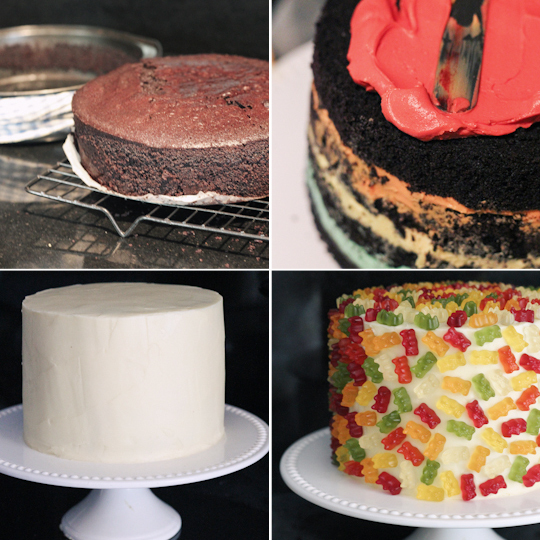 How did you get your icing so perfectly smooth to coat the sides of your cake? Wow.. it's just awesome. I could really go a piece of that cake.. I love the escaping gummi bears, hehe. I love this cake! :D Awesome! You know what? I'm gonna make EXACTLY this cake with my girls at my Birthday party. I love to do baking parties, cause it's so fun and messy! So when I saw this cake I knew we would have to do this...precious cake! I love this! Wonderful job. 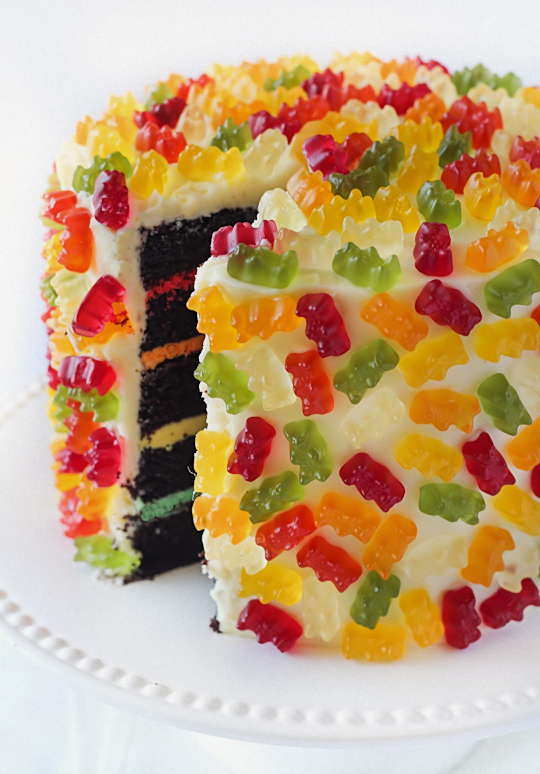 I would have never thought to put gummy bears on a cake. If I juat remove the cocoa powder would that change it into a vanilla cake? If not how would I go about doing that? Gummy bears seem chewier and slightly harder to me too! I've found generic brands to be softer and juicier. I made this cake for a dear friends 30th Birthday last weekend! It was a huge success and absolutely delicious! As it was a special birthday, I actually made three 5" cakes! One with gummy bears, m&m's and sprinkles! It was a massive day in the kitchen as I only had one small tin and need 6 cakes to make the 3 cakes but it was fantastic and everyone was suitably impressed! People kept asking me if a professional had made it! Thank you for your amazing recipe and all the tips! I cant wait to try a few more! I love the cake, do you have suggestions to make the smaller version of this cake? As mentioned in the recipe, you can halve the amounts to make a cake with less layers. If you want to keep the height you will have to find smaller tins. Such a great idea! I love the colored layers in between. I am ready to have a piece now! Very tasty, but difficult to translate to American units. Since she gives ranges, you say, hmm, 8" or 9" layers. It has to be 9s. Not nearly enough frosting for 8s. I won't try to use silly SI in the kitchen again. Hate it. I just made this cake but as a White Chocolate Cake with White Chocolate Cream cheese frosting. Turned out soo cute just like the picture. Beautiful! Amazing I want to make one for my daughter! It's her favorite candy! I made mine the night before and it was okay, the gummy bears are quite hard as they are, as I mentioned in the post. Very clever! 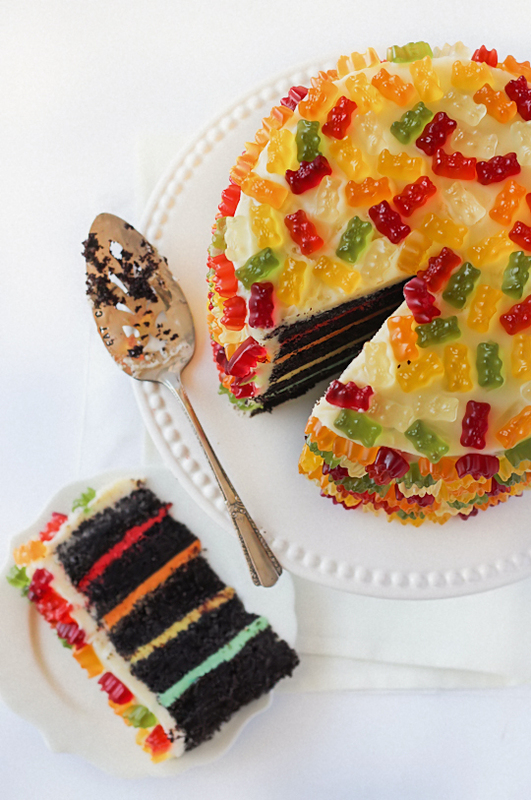 When I first saw the photos, I wondered if the chewiness of the gummy bears would work well as part of the cake. 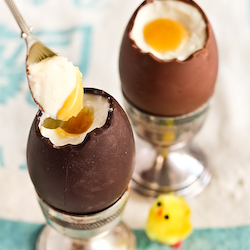 You mentioned this later on in your post, so I am curious - would you make this again? Or would you try another colorful candy, such as M&M's or Skitttles?